Dr. Bruce Richard Barkstrom, of Asheville, N.C., passed away on 1 July 2018 after a long illness. Despite his illness, Bruce continued to contribute to science until shortly before his death. Bruce earned a B.S. in physics from the University of Illinois at Urbana-Champaign in 1966 and M.S. and Ph.D. degrees in astronomy from Northwestern University in 1973. He spent a long and meritorious career with NASA and the National Oceanic and Atmospheric Administration (NOAA); he retired from NASA in 2006 and from NOAA in 2008. Bruce made many significant contributions to instrument science, data analysis and interpretation, and data stewardship. He will be remembered by his colleagues for his leadership as a principal investigator for NASA’s Earth Radiation Budget Experiment (ERBE) and the Clouds and the Earth’s Radiant Energy System (CERES) instruments, as well as for the development of software for processing data from those instruments. Other noteworthy accomplishments include his commitment to generating data directly understandable by people, known as semantic data modeling. Bruce also was a vocal member of the Earth Observing System Data and Information System (EOSDIS) Advisory Panel (also known as the Data Panel). He played an active role in developing a maturity model for climate data records. Other noteworthy accomplishments include enthusiastic participation in the Earth Science Information Partners’ (ESIP) Data Stewardship Committee, his commitment to generating data directly understandable by people (known as semantic data modeling), his prolific writings, and the advice he offered as a mentor to younger colleagues. During his career, Bruce authored or coauthored 117 publications with 5,323 citations. Of these, 37 have been ranked as highly influential by Semantic Scholar. Among them are articles in journals and conference proceedings as diverse as Applied Optics, Earth Science Informatics, Eos, IEEE Transactions on Geoscience and Remote Sensing, Journal of Geophysical Research, Journal of Grid Computing, Reviews of Geophysics, Science, and Software Configuration Management. He covered a wide range of topics in his publications. Notable among his early publications was a seminal work that represented the first use of a radiative transfer equation to model the albedo of snow. Notable among his early publications was “Theory of the Optical Properties of Snow” [Bohren and Barkstrom, 1974]. This seminal work represented the first use of a radiative transfer equation to model the albedo of snow. The authors also demonstrated experimentally that snow density does not affect albedo. Another of his papers, “Clouds and the Earth’s Radiant Energy System (CERES): An Earth Observing System Experiment” [Wielicki et al., 1996], described the suite of satellite sensors and analyses that measure the spatial distribution of Earth’s radiative exchanges with the solar system. From 1997 through 2017, CERES was launched on five satellites: Tropical Rainfall Measuring Mission (TRMM), Terra, Aqua, Suomi National Polar-orbiting Operational Environmental Satellite System Preparatory Project (SNPP), and NOAA-20. Still operating today, this experiment truly provides the bulk of our knowledge about Earth’s radiation budget. The paper now has more than 1,400 citations. Even after retiring from NASA and NOAA, Bruce continued to collaborate with colleagues on the advancement of science, coauthoring several papers and giving particular attention to the maintenance of the scientific record of Earth observations. He passed away in the midst of writing a book on data management, a project that grew tremendously in size and scope, reflecting the breadth of his knowledge as he worked on it. Bruce had a great passion for making data accessible and useful. He was instrumental in developing data formats for the CERES experiments. Among the instruments in the Earth Observing System (EOS), CERES products required analyzing the entire set of global data. Bruce relished the challenge of building systems that could handle this computational feat. Bruce was the main architect of NOAA’s scientific data stewardship project, a precursor to the Climate Data Records (CDR) program. He spent a sabbatical developing tools for scientists to develop good data models for scientific data. He produced a wide range of papers and talks on many data subjects, such as the economics of climate data preservation and evolution, the semantic grid (grid computing using semantic data models), digital libraries, and how to represent uncertainty. He constantly shared his writings with many of us, and we found that he could write faster than we could read and understand. In the 1990s, EOSDIS was just getting started with plans to become a major system responsible for managing most of NASA’s Earth science data from pre-EOS and EOS missions. As an active participant of the Data Panel, Bruce had more experience with large global data sets than other panel members. He was especially active as chair of the Ad Hoc Working Group on Production. He expended considerable time and effort to make sure the requirements for processing EOS data were well understood by EOSDIS developers. Using his intimate knowledge of CERES data processing, Bruce developed a detailed model of data flows, processing loads, and storage. Using this, he developed a cost model for EOSDIS. This and other work involved developing many thousands of lines of Ada code; he frequently regaled his colleagues about the benefits of this high-level object-oriented programming language. 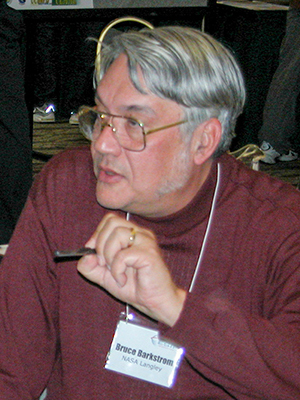 Bruce had advice for his colleagues on a wide range of topics, such as interpretations of the Open Archival Information System (OAIS) Reference Model, ways to construct controlled vocabularies, and how to and why develop standard models of user access patterns for purposes of better descriptive metadata creation. He constantly shared his writings with many of us, and we found that he could write faster than we could read and understand. Younger colleagues found Bruce simultaneously approachable and intimidating. Bruce mentored these colleagues by writing papers with them, by sharing his opinion about the community at meetings such as ESIP’s and AGU’s, and by discussing the book on data management he was developing. Bruce was intimidating because he seemed to have (deeply informed) opinions about any topic, though he was approachable at the same time. When challenged with legitimate arguments, he would yield graciously. He loved to play with new, out-of-the-box ideas, but even more, he loved collaborating with others in developing his ideas. Bruce was a scholar in the fullest sense of the term. He loved to play with new, out-of-the-box ideas, but even more, he loved collaborating with others in developing his ideas. He would routinely carry on email conversations lasting weeks or months, including emails that were often a combination of technical ideas, philosophical musings, a funny story, a photo or two, and a draft of his latest document. We do not know where his phenomenal intellectual energy came from; all we know is that we were privileged to encounter it, especially coupled with his humor and generosity. Bruce leaves behind his wife of 52 years, Alice Barkstrom; his children, Gustaf Barkstrom and Anne Moore and her spouse, Ryan; his brother, John “Jack” Barkstrom; and two grandsons. Barkstrom, B. R., and C. A. Mattmann (2012), A simple model illustrating the virtue of replication for long-term information preservation, Earth Sci. Inf., 5(2), 105–109, https://doi.org/10.1007/s12145-012-0100-4. Bohren, C. F., and B. R. Barkstrom (1974), Theory of the optical properties of snow, J. Geophys. Res., 79(30), 4,527–4,535, https://doi.org/10.1029/JC079i030p04527. Wielicki, B. A., et al. (1996), Clouds and the Earth’s Radiant Energy System (CERES): An Earth Observing System experiment, Bull. Am. Meteorol. Soc., 77(5), 853–868, https://doi.org/10.1175/1520-0477(1996)077<0853:CATERE>2.0.CO;2. Citation: Ramapriyan, H. K., R. R. Downs, J. Dozier, R. Duerr, M. Folk, J. Frew, N. Hoebelheinrich, C. A. Mattmann, and G. Peng (2019), Bruce Barkstrom (1944–2018), Eos, 100, https://doi.org/10.1029/2019EO115561. Published on 11 February 2019.